Christmas is just less than one month to go. Hooray! It is holiday and it is Christmas again. We went Mahkota Parade for a walk yesterday (of course after I read my notes). Some shops inside MP already decorated with Christmas stuff and broadcasting Christmas songs and even Christmas MTV(a bit zha dao lo). The picture for this time is up to 25 pictures which I snapped when outing yesterday. And....2 marvelous incident. Curious right? Keep watching for the pictures down here la. Stage of Mahkota Parade. Not bad huh. The Christmas tree is as big as my hand. Sony Ericsson road show car, with more than 50 model phones display on the side of wings. Here come the marvelous accident when we going to Big Apple. A double decker bus crash to a Viva beside and a Honda Civic in front. OMG! Luckily no people hurt in this accident. One of the victims - Honda Civic driver. Luckily he didn't turn out to be violence. What he take out after the accident is not stick or spanner, but a Digital SLR camera to snap the photo. Cool man! Traffic police arrive. Give 'salmon' or solve the problem? Don't care lo, hungry already. Go to Big Apple first. Yeah! Two donuts are belong to me. Any handsome guy pass by? Don't let him see my dirty lips. After the tea time, we went to Carrefour. Vacuum Cleaner, they place the card board upside down. Bought 1 for home use. I thought that is RM66 from far. -.-" . Don't try to make me happy la. Big bear and little bears under the tree, waiting for Christmas to come. Marvelous! A bottle of 'branded' mineral water sell for RM9.08. Of course, Carrefour brand what. Here comes the important part while we in Carrefour drinks section. Wonder where those Lipton Ice Lemon Greentea go? 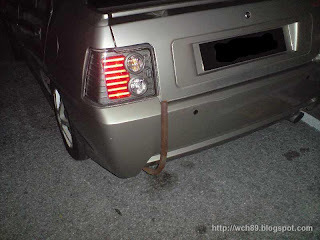 Where is that pipe connected to? Anyone inside the car booth? We went Capitol to eat something that is one of the symbolise in Malacca. Not Capitol satay celup la. See the pictures below. It is in the lane. Time past so fast. Today already Saturday. Woke up at 10.35am this morning and saw ah Tong's phone on the floor, again....(can't remember how many time I see his phone drop on the floor while he sleeping already). Boil water and make myself a cup of yam sesame cereal, ate 2 eggs and a piece of cheese. Midterm for Malaysian Studies is coming soon but the notes is still untouched, I hope I am able to read all the notes before enter the exam hall. Is this the new idea to reduce the carbon monoxide and black smoke pollution from green lovers? 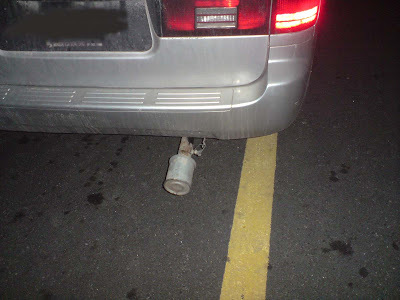 A Prestigo driver did that by using a tin like container to cover up his car exhaust pipe. Human are marvelous! Hey hey! I mention first. If you are lack of time or not patient enough, I suggest you close this windows now! This gotta be a long blog with many pictures. Just back from Ipoh at 7.00pm this evening. We went to Ipoh for the World Chinwoo Carnival on Saturday morning and reach there at 1 o clock something. The MMU van's driver drive so fast man! 150km/h! I am sure those who sit in front are shocked until they don't dare to sleep. Lol. Now give a chance for the pictures to talk. We have our breakfast in Dunkin Donuts in the resthouse beside the highway. At afternoon, we have our lunch at the hawker stall in quite a hidden place in Ipoh. This place is famous with its laksa. We have our dinner in a Restaurant Lou Wong Tauge Ayam Kuetiau, we ordered the famous food which are white cutted chicken and bean sprouts. You can see how delicious those food are, they started to eat before I finish taking the photo. After our dinner, we went to the World Chinwoo Carnival opening ceremony in Stadium Indera Mulia. 谭腿, performed by the participants. See the little girl in the red circle? That is the youngest participant (4 years old). Cool right? This longest dragon in Malaysia. It needs 60 peoples to play. Majlis Sukan Negeri Perak, this is the place where the tournament held. They start to pratice before the tournament start. Those kids can play the weapons very well. About 1 o'clock, we went to Ipoh Parade to shopping. The living cabin already start selling the Christmas stuff and broadcasting the Christmas carol. I can feel the Christmas mood is coming!!! See the kad in front of the Santa? It means Santa doesn't smoke, Santa doesn't take photo, Santa doesn't eat fast food and Santa say 'Thank you' for noticed him.